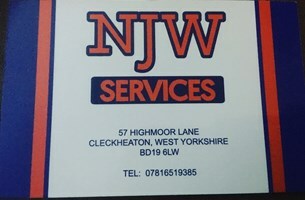 NJW Services - Central Heating Engineer based in Cleckheaton, West Yorkshire. Hi and welcome to NJW Services. We are a small company offering Central Heating Services in the local area. I personally have over 20 years experience, and am gas safe registered, I have one apprentice working alongside me as well as undertaking professional training and also another gas safe registered engineer with many year's experience. Thanks for looking - Nick.